TableTop Day: We Played Emperor's New Clothes! The Growing Up Gamers crew are all about the tabletop games. Yes, we sneak in a videogame every now and again, but boardgames, card games and roleplaying games are what we love most. 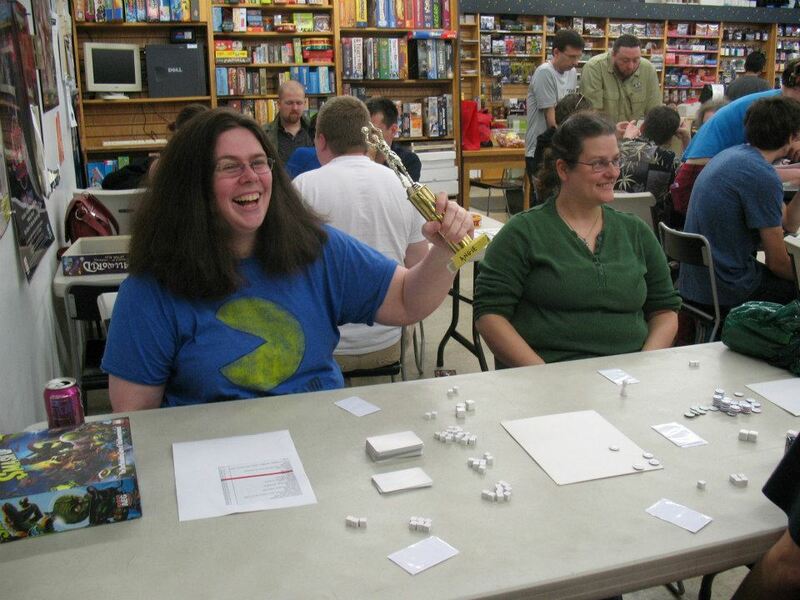 So naturally... we thought Geek & Sundry's International TableTop Day was a brilliant idea. And we knew that we had to participate. So we went to our favorite game store, Rainy Day Games in Aloha, Oregon (near Beaverton). Las year, we had the pleasure of meeting Jonathan Liu at GameStorm in Vancouver, Washington. Jonathan is a Senior Editor at the GeekDad blog, and a game designer. 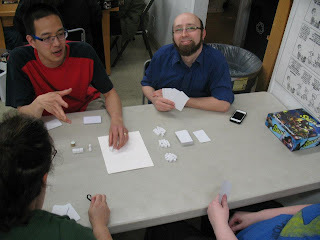 At that time, we played another game he and a colleague were working on and had a great time. Currently, Jonathan has a Kickstarter project running for another game: Emperor's New Clothes. If you have not yet checked out the Kickstarter for Emperor's New Clothes, please do. A lot of people take a look and are not quite sure what to think. What about all these white cards and components? The video on the page explains they were printed with Regulated Operator Optical Screening technology, aka "ROOS", which only allows "true gamers" to see it. Do you see where this is going? Thematically, this is the story of The Emperor's New Clothes by Hans Christian Andersen. Rather than butcher a synopsis, I'll allow Wikipedia to do that. Anyway, I want to report that we had the opportunity to play Emperor's New Clothes. Yes, you read that right: we played Emperor's New Clothes. Perhaps the most brilliant part of this project is that Jonathan actually created a game, a very fun role-selection/resource management game that goes with it. The thing is... in its current state, we played with blank components. And we had a blast. I am sure at least a person or two nearby thought they were being "trolled", but playing was very fun. Jonathan explains how to play while Randy cheeses it up. So, how do you play? I'm not going to restate the entire rules, which Jonathan posted here. But basically, we all selected a role, which was secret. There are three resources: Dignity, Gullibility & Gold. Roles use and score these differently, and you get them (mostly) through rolling dice. Then there are the action cards. So the action cards do what you say they do. One of the biggest parts of the game is that once you state what is on a card, that's what's on it. So there's a shared storytelling aspect of this when played in this manner. Though in all honesty, were this game printed with real components and action cards, it would still play well, but lose the "shared storytelling" aspect. If you find yourself wanting to play that game, download the rules. But if you are a game designer, back the project. What you -do- get is a box of high-quality blank components that you can build prototypes with. Seriously, it's very tempting to back it just for that. If you are reading this the day it was posted, April 1st, 2013, then there is still time to support his project. Yes, it is a real project. No, this is not an April Fool's Day joke. Not exactly. We would like to thank Rainy Day Games for hosting this amazing event, as well as for the pictures they took. And, of course, we would like to thank Jonathan Liu for taking the time to teach us Emperor's New Clothes. Does anyone else have an International TableTop Day story to share? Leave it in the comments!